I`m here in Dalmatia. Working. Clients sent us to make traveloques (lovely word) starting from upnorth to to end of it. And if I may say, it is pretty exhausting. Oh, I love the old castles, palaces, roman ruins, friendly people, stunning islands, clear sea and good food but…Let me say this clearly : I am an urban brat! If I want one small decaf, then I like to get it! And I like wide, open roads. You know, the ones with at least a possibility for 2 cars driving by? OK, let me start from the beginning. The client wanted to photograph and describe almost every place you may find on the map, which include some of the…the…the..smallest and strangest places you can imagine. Forget the decaf, forget the shops, forget everything BUT what we all need is a decent road to get there, right? Well, some of the places are actually invented to test your faith. Seriously. Imagine a 7 feet wide road for both directions coming down around the mountain for several miles, where from your right side is a solid rock high at least 10 feet high and on your left there are, all the way down, a 150 feet high, and more, cliffs. Without a fence. Any type of fence. Lost your touch in Jesus? Buddha? Alah maybe? Well, now is the best time to restore it! Start praying people! And do it fast. I couldn`t bealive it! No wonder there are only few houses in that bay, WHO would want to pass through this experience every day?!? Oh, but maybe that`s just me, because my Loving one was overwhelmed by this leniency saying „Aaaah! Yes, I could spend a holiday here. Yeeeees, sun, sea and a book!“. A book? A book?!? To spend a vacation here, I would need a whole freakin` library!!! Including the entire opus of Louise Hay, Robin Sharma and Deepak Chopra just to gather enough courage to get back up there. THAT`S something I want to forget. As soon as I can. Then the flags. Croatian flags. You can see it everywhere: on the city streets, on churches, on private homes. At first I thought that maybe it`s a national holiday but then I realized that the traces of war are still very alive in people`s mind and hearts. And we have also passed through the zone which is still mined. Not a pleasent feeling. That I want to forget too. 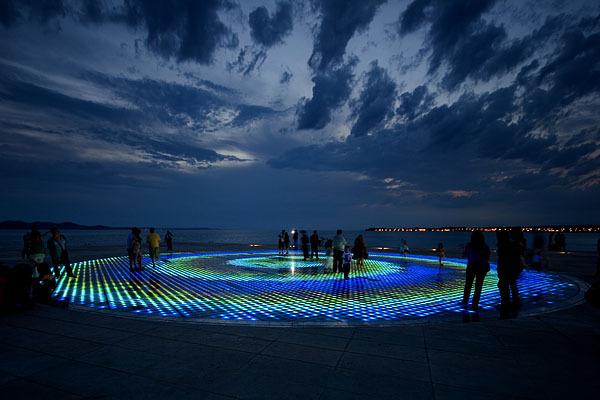 Oh but I was in Zadar last night. Absolutely beautiful. The Roman forum, St.Donat`s church, Anastasia`s church, Kalelarga street…..
And there is something you can see only here: Sea organ and Greeting to the sun. Sea organ is the most beautiful creative thing I ever heard of. Basically, under the stairs, which are kissed by the sea, there are 35 pipes which, as the waves hit the coast, produce incredible ever changing melodies. These are the most natural and soothing sounds that I have ever heard. I could sit on that stairs forever. That I won`t forget. Hell, I recorded it on my cell! As a present, giving you one of the photographs that my dear and only one have made, the Greeting to the sun . Enjoy it.